Published on 14th February 2016 . 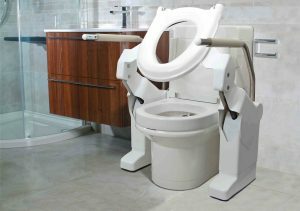 A blog by Robin Tuffley from@ Clos-o-Mat, Britain’s market leader in toilet solutions for elderly & disabled people, at and away from home. Using functional rooms – including the bathroom/ going to the toilet- is the second biggest problem faced by families with a severely disabled child. Would you benefit from a toilet adaptation? I would ask: do you use a riser recliner chair? Can you easily turn the pages of a book, peel vegetables? If you answered ‘yes’ to the former, and ‘no’ to the latter, then a toilet adaptation would really help. It would help you remain independent, and delay, or avoid, the need for a carer to help you. Let’s start at the beginning: how easy is it for you to get on and off the toilet? You may choose to lean on your washbasin for a bit of support, but make sure the supporting wall is strong enough to bear the additional, downward load- otherwise the basin will end up on the floor, and you’ll have tap water pouring everywhere! A grab rail may be a more appropriate means of gaining the support you need, whether you are ambulant or transferring from a wheelchair. One inevitable in all our lives is that our bodies change as we age; in all likelihood over time you will need more support. A toilet lifter replicates the natural motion of sitting down and standing up, automatically and smoothly lowering the user over and onto the toilet and then raising them to standing, all controlled by the push of a button via integral arm supports on the lift. So, you’re sat on the toilet. Another inevitable in our lives is that over time, we tend to change shape and size. Is the toilet seat the right size for you? Does it properly position and support you? If your buttocks are not correctly parted, effective bowel evacuation will be difficult. That potentially causes health issues through straining. It makes it harder to clean yourself properly, exposing you to risk of faecal contamination, be it sore skin in that area, dirty nails. So, what type of toilet do you need? Soft seats are an ideal solution if you have little ‘padding’ and tend to spend a while on the toilet. Bariatric seats help support you if you have a larger frame. Even larger, and you may find a bariatric bench more suitable, in that you will be correctly seated and supported over the pan. Horse-shoe seats accommodate the male anatomy better. You have completed your business. This is why I asked about reading the newspaper, peeling vegetables: tasks that require manual dexterity and strength, particularly pincer grip. Can you easily reach toilet tissue, grasp it, tear it off, twist and wipe yourself? A wash and dry toilet does it all for you! Looking like a standard WC, it has in-built douching and drying. It CAN still be used conventionally but, if you struggle with the whole toilet paper operation, that process is eliminated. At the trigger of the operating mechanism- flush pad, remote control, infra-red proxy switch- it flushes the loo and douches your bottom with warm water, then warm air dries you. That may be stating the obvious, but it does deliver that independence and feeling of decency. You cannot put a price on that. You can put a price on the cost of a wash & dry toilet compared to having a care worker visit just to take you to the loo or help you to a commode: that care worker visit, just for a year, costs almost TWICE as much* as changing the toilet to a wash & dry version! So, as the Government continues its drive for us all to remain at home for as long as possible, head to the loo. A few minor changes can make the world of difference to retaining your independence in your most basic of daily personal care tasks. Having a toilet adaptation is a way of saving home care fees. Instead of relying on outside help to come and support you, you can update and make your bathroom a more comfortable place, giving you your independence and dignity. If you would like more information on the types of toilet adaptations available, details can be found below. If you would like more information on toilet adaptations please speak to Clos-o-Mat who will be pleased to offer you some guidance.